Due to the ongoing difficulties from de-monetization in India, ISKCON UK management and TOVP UK have successfully arranged with ICICI Bank in the UK the use of the Rupee Card for UK devotees traveling to India. This card can be conveniently used for exchanging your money when you visit Mayapur or Vrindavan and indeed all over India. This card is fully in accordance with the Reserve Bank of India (RBI) guidelines. Please see detailed info below. 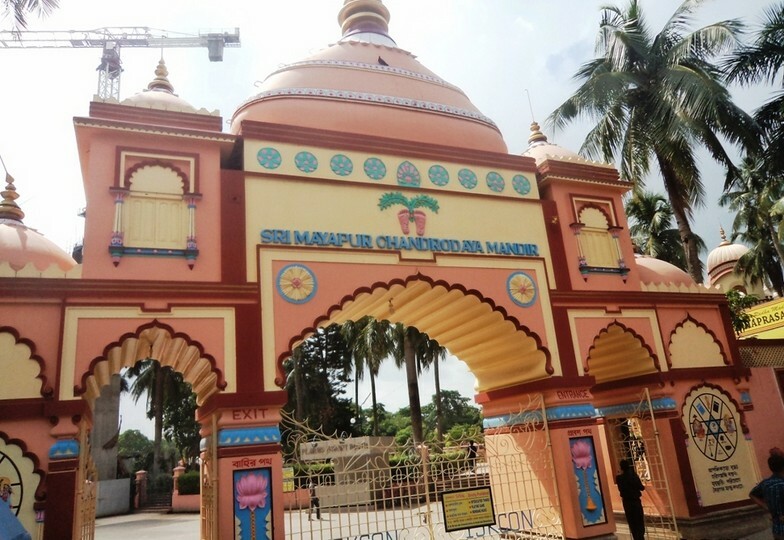 Many devotees returning from Mayapur in the past few weeks reported that there is no money in the ATM at Mayapur, and foreign exchange has limitations for exchanging cash. So we strongly advise you to purchase your Rupee card facility before you leave the UK. For your information. We now have an ICICI Bank branch in Sri Dham Mayapur with ATM facilities. We would like to wish all devotees traveling to India for Gaura Purnima a safe journey. We will continue to endeavour to help you in the future as a mark of respect and appreciation for the service you render to Srila Prabhupada’s ISKCON in the UK and to the Temple of Vedic Planetarium. Accept Greetings from ICICI Bank UK PLC ! As requested, we are pleased to provide you with the following information on Indian Rupee Travel Card. · It is a prepaid travel card that you can load with the required amount of India Rupees even before you travel to India and have it ready for all your expenses in India. · You can also send your application form and documents by post to: Indian Rupee Travel Card, ICICI Bank UK Plc, PO Box 68921, One Thomas More Square, London, E1W 9HB. If you’d like any help completing your form, or have any questions please call us on 080 81 31 41 51 (Freephone from UK landlines). · A completed application form. Click here to complete the application form online. · A copy of your passport (valid for at least six months). · Valid proof of address (For e.g. UK Drivers License, Utility bill not older than 3 months, Latest Bank statement received by post). · A recent passport sized photograph of yourself (for postal applications only). · When sending copies of your documents by post, each document should be self-attested with the words “This is a true copy of the original” and have your signature. · Once your application has been approved, the bank will send you a welcome pack with your Primary and Secondary Cards along with the respective PINs. · If you have applied for the card at any ICICI Bank UK PLC branch, then the welcome pack with your Primary and Secondary Cards along with the respective PINs, is handed over at the time of application. · When you receive the welcome pack you can load your Card. · Your Card can be loaded subject to a maximum balance in the Card being INR 2, 00,000. Any load instruction that makes the total account balance on your Card exceed INR 2,00,000 will be declined. Please Note: The card issued to you is a non-reloadable card, hence can be loaded only once. · Your card can be loaded by transferring funds in GBP from any UK bank account to ICICI Bank UK PLC’s account (Account number –76172238, sort code 30-00-81). · Enter your 16 digit Indian Rupee Travel Card number in the payment remarks/reference field while transferring the amount. Without this information, the bank will not be able to load your Card. · The exchange rate applicable to the transfer will be the foreign exchange rate prevailing on the day of successful receipt of funds. · The amount will be loaded in INR within two working days from the time of receipt of funds and a confirmation will be sent to you. · You can choose to close your card by contacting the 24 hour Customer Care at http://icicibank.com/customer-care.page? or 080 81 31 41 51 (free phone from UK landlines). · The card will automatically close on the 180th day from the date of activation and the balance proceeds will be refunded to the account from where it was initially funded. · You may also visit any of ICICI UK Branches to unload / close your card. · You can load the card online with a maximum balance of INR 2,00,000 using your nominated UK bank account or Building Society. · The card can be loaded only once with a validity of 6 months. · There is no minimum balance required on the card. · Please note: Due to the current demonetisation of INR 500 and INR 1000 notes by the Government of India, the current limits for cash withdrawal on the cards might vary depending on the limit set by RBI. You may refer to the website of Reserve Bank of Indiahttps://www.rbi.org.in/ to know more. The ICICI Bank Indian Rupee Travel Card is offered by ICICI Bank Ltd. and distributed by ICICI Bank UK PLC to the Cardholder in the United Kingdom (UK). ICICI Bank UK PLC’s role is solely to distribute the ICICI Bank Indian Rupee Travel Card to customers in the UK and assist in facilitating customer’s documentation to initiate the relationship with ICICI Bank Ltd. ICICI Bank Ltd., India is not authorised or regulated by the Financial Conduct Authority and is not protected by the Financial Services Compensation Scheme (FSCS). Hence, the Card is not covered under the UK compensation regimes such as Financial Services Compensation Scheme.